In the crack of dawn in 2000, a young man was found running on the streets of Bristol, England. Behind him, sirens from police cars jolted the otherwise peaceful residents of the town, awake. The man hid behind a rubbish lorry, waiting for the sirens to pass by when he noticed the serial number on it. It was stencilled and he was immediately struck by its prominence and outlandish approach. At that point, he realised he had been hit by an incredible idea. 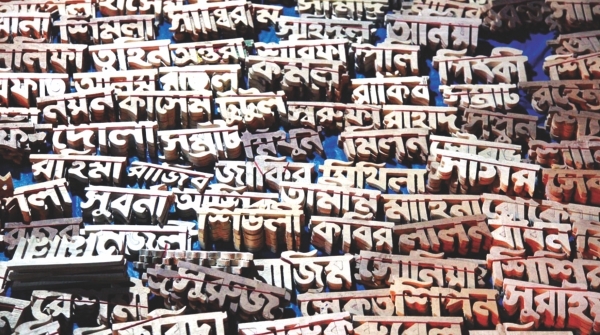 Shahbag movement has become a calling for artists and activists alike. In less than ten years, the young man who once hid behind a rubbish lorry became proclaimed as one of the most prominent icons of graffiti. Bansky, as he came to be known as, used a distinct technique of stencilling to spread messages of anti-capitalism, anti-war or anti-establishment (source: Wikipedia). Over time, his art became a voice of the unheard and oppressed, challenging norms while staying allusive - and turned the world upside down. Street art became integral to the movement. The role of art and culture in revolutions across the world is often underplayed. Amidst slogans, protests and weapons, the voice of expression and supposedly subtle confrontations play a more powerful role than one can imagine. During the 1971 Liberation War, the Swadhin Bangla Betar Kendra artists became significant influences for the muktijoddhas on the grounds. Apel Mahmud's songs Mora Ekti Phool Ke Bachabo Boley Juddho Kori ("we fight to save one flower") and Ek Shagor Rokter Binimoye ("in exchange of a sea of blood") evolved to iconic numbers that transcended inspiration not only during the time of war, but even today. Tareque and Catherine Masud's Muktir Gaan, completed in 1995 tells the true story of a troupe of singers who travelled across the battlefields of 1971 to sing scores of motivation to the freedom fighters. Combining footage from American filmmaker Lear Levin, the Masuds were able to convey a story that gives an insight into the cultural and social settings of the war - and the strength of art in bridging a movement together. Outside the borders of Bangladesh, Cold War photographers such as Robert Capa, Henri Cartier-Bresson, George Rodger and David Seymour became integral in recording the shifting powers of a struggling world. Fidel Castro's rise in Cuba was photographed by Magnum artist Burt Glinn (source: Phil Coomes, Revolution through the eyes of Magnum photographers, BBC) while more recently, the 2011 Arab Spring was covered by Moises Saman. At the heart of action, photographers as such have not only frozen a climactic moment – but given the world a constant frame of reference for revolutions to come. 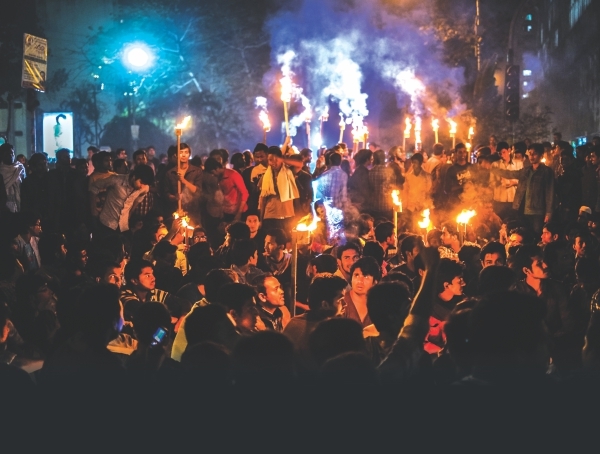 Therefore, it came as no surprise, particularly in the age of technology and social media, that the 2013 Shahbag Movement was responded by a number of artists from different streams. Photographers, painters, street artists, performance artists, filmmakers, animators and musicians – almost everybody took a stance during the movement. From murals to collaborative graffiti, street drama to new music, the unity of the people was further propagated through the collaboration of artists. Young documentary fimmaker, Ahmed Rajib, for example explains his contribution. Having come up with a 2-minute documentary that showcases the evolution of the movement with reference to the spirit of 1971, Rajib feels a secular and apolitical movement as such was a calling for local artists. From graffiti to name stamps, the movement accommodated different forms of expression. Young photographers from the Flickr-based group, Bangladeshi Photographers have hosted an open-air exhibition of their work from the movement at Chobir Haat, inside the 'zone' of Shahbag. 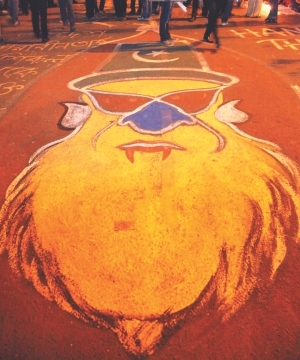 Installation pieces, such as E Khacha Bhangbo Ki Kore and caricatures of war criminals on the gates of Charukola added momentum to the movement, taking the social statement forward towards long term reforms in the country. 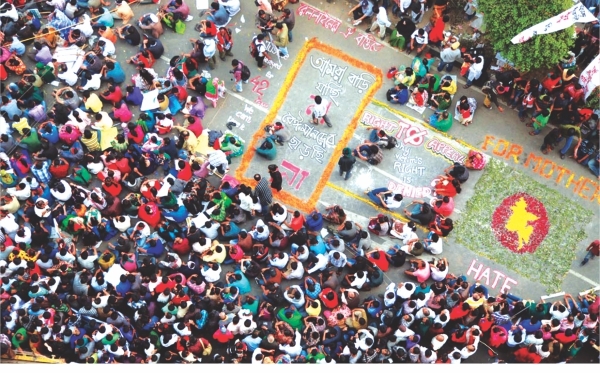 Performance artists have staged regular dramas in Shahbag, often inviting members of the audience to participate and using the slogans as dialogues in their piece. Cartoonists have been busy preparing on spot posters with line caricatures of war criminals or slogans, and handing them out to protestors. Slogans evolved to street murals. 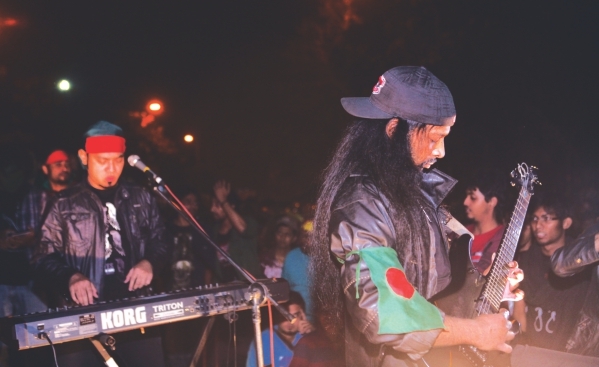 Meanwhile, musicians have performed almost regularly during the initial seventeen days of occupying Shahbag. Underground band artists have come together and pulled off acoustic gigs, chanting the ever familiar lines from Purbo Digontey. 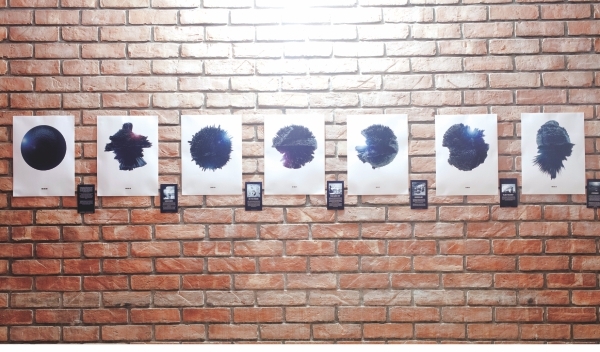 Musicians from Mohakal, Nemesis, Blunderware, Mechanix and others have collaborated to host an open microphone performance, and echoed the slogans with scores of inspiration. Chirkut, on the other hand, have composed a new number on Shahbag, and performed it live at Raju Bhashkarja with Warfaze, Shunno, and Dreek amongst others. The spontaneous unity of musicians with the protestors boosted their cause and inspired more young artists to contribute towards propagating the movement. Art, beyond the scope of artists is a prominent influence in everyone's lives. Whether we are creating it, experiencing it or simply, observing it as a bystander – it leaves an impression that transcends beyond the moment and reminds us of how powerful our identity as individuals is in this world.